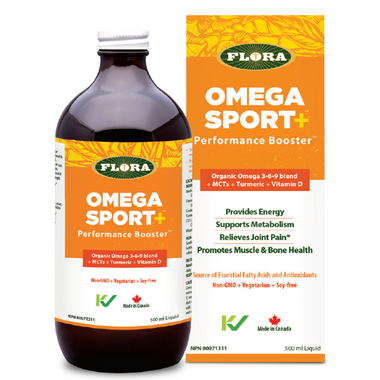 Flora Omega Sport + was formulated for active people with both athletic performance and recovery in mind. Made with Medium Chian Triglycerides, Omega 3 and omega 6 essential fatty acids, a unique turmeric extract called Curcuwin and Vitamin D.
Suggested Use: Shake well before use. Take 1 Tablespoon 3 times daily with food. Refrigerate after opening. Shelf life: 1 year unopened. Ingredients: Medium Chain triglycerides 6994 mg, Flax Seed Oil 5455 mg, Evening primrose Oil 70 mg, Turmeric extract 50mg Vitamin D 3 200 IU. Non Medicinal Ingredients: Organic Sunflower oil, Organic Pumpkin Seed Oil, Organic Coconut Oil, lecithin, rosemary extract, povidone, hydroxymethyl celluslose and tocopherols. Caution: Consult a healthcare practioner ifsymptomspersit or worsen. Consult a health care practioner if you are 1) pregnant or breastfeeding 2)have gallstones or a bile ductobstruction 3 )have stomach ulcers or excess stomach acid. Manufactured in a afcility that also processes mustard and wheat. What a great omega-3 product! My SO and I are really into sports. We have seen an improvement in recovery with this product. The smell is much stronger than the taste. It doesn't taste much at all. We take our 3 tbsp daily and go on with life. Our muscles are recovering quicker and we do feel an energy increase. For anyone wanting to upgrade their omega 3 intake, this is a good way to go. And the company is a great one!